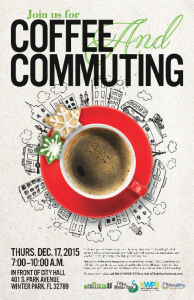 On Thursday, December 17, 2015 from 7 a.m. to 10 a.m., reThink hosted a “Coffee & Commuting” networking event at Winter Park’s City Hall with support from the City of Winter Park, Keep Winter Park Beautiful & Sustainable Advisory Board and Healthy Central Florida. Park Avenue area employees were invited to stop by and enjoy a light breakfast and coffee while networking with the area’s transportation experts from reThink, SunRail, LYNX, vRide and Juice Bikes. This is the third year in a row that commuters who work in the Park Avenue area in downtown Winter Park were challenged to “reThink” the way they get to their jobs. The goal was to get people to try a new commute option, whether it is riding SunRail or the bus, carpooling, biking or walking to work. Park Avenue area commuters that participated earned a $5 gift card just for trying something new. New for 2015, drive alone commuters were able to participate and learn about their commute options and see how many of their co‐workers were already reThinking their commute. Commuters answered the challenge and arrived with approximately 25 claiming prizes for arriving on foot, on twowheels or by showing off their SunRail SunCard or a carpool selfie. Many of our initiates were done with no marketing budget. By identifying and joining efforts with a range of individuals and regional organizations motivated by sustainability initiatives, healthy lifestyles, and economic recovery, the oneperson outreach team has extended its reach and expanded its network of participants beyond a large 12 county region. These low‐cost efforts have proven successful on multiple fronts, and all have significantly improved recruitment outreach efforts and program implementation, while overcoming the obstacles of a limited budget and available outreach staff. Effective marketing is set on simple principles attracting attention, stimulating interest, desire and action. For example, at large outreach events we developed a customized theme that brought commuters to our outreach table. We look for every opportunity to engage and bring excitement to the program with creative marketing. The goal was to rejuvenate our program and make it fun and interactive for our commuters to approach the table. We developed and memorized a short 20 second informative message for each commuting theme. People move quickly at events so having something brief and engaging is essential for capturing their attention. Our program recruited enthusiastic students and staff volunteers to help with the table. We made sure they knew the prepared message as well. We role played with the volunteers to make sure they were able to share a valuable message. 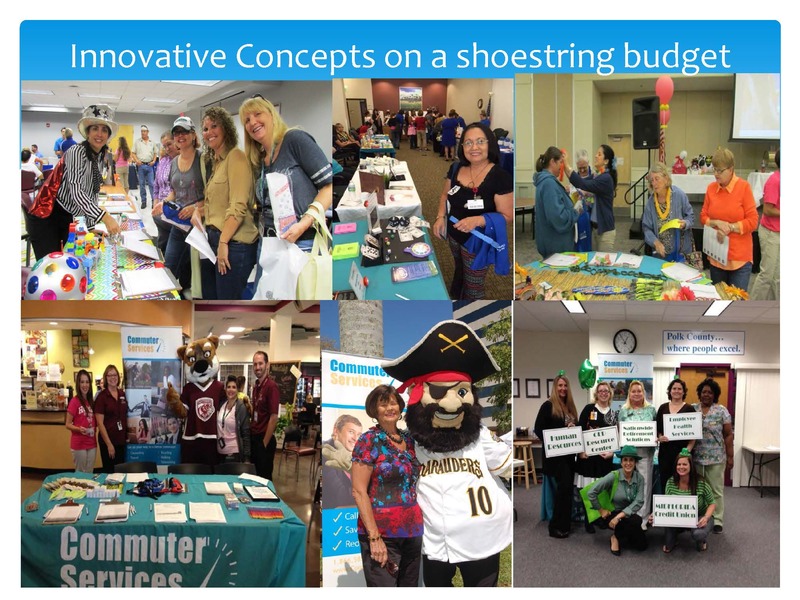 Our program worked with employers to develop challenges and creative ways to approach commuters during the outreach events with costumes, themes, company mascots, activities, and fun commuting games. At various employer sites our program worked with organizations to encourage employees to visit our table and have employees vote on the table/organization that brought the most employees. The goal was to get employees engaged, answer questions, and get them registered for the program. 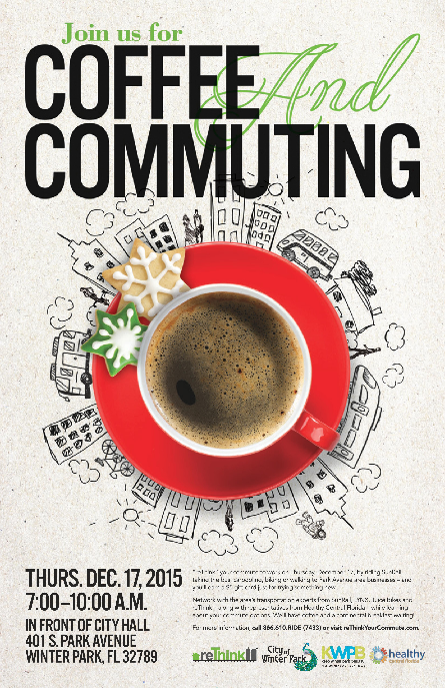 Employees needed to report back to their employer with three important commuter facts. The employees then casted their vote for the organization that had the most creative marketing and best program resources. Commuter Services has won “The Best Outreach Table” at 9 employer sites and “The Employer Sponsored Oscar” two years in a row. During one employee recruitment fair we spent the day registering and interviewing over 400 commuters on a red carpet with a microphone and loud speaker. We asked them, “how was their commute to work that day? Are they a VIP commuter or have they shared a ride with another commuter celebrity?”. The commuters enjoyed the interaction and the attention. This marketing outreach has tripled our registration efforts at each event and contributed to bringing thousands of new commuters to our database. During some of the outreach events the local government channel was on hand to report our efforts and to encourage employees that have not attended the event to register with the program. With a limited staff and budget, we are always looking for ground‐breaking ways to connect with employer partners, stakeholders, commuters, students, media, and local communities. Adopting a range of marketing strategies (through direct interactions, using community resources, and communicating online) has helped our program reach out to major employers, smaller adjacent businesses, and community stakeholders to pursue and engage prospective partners and showcase the program’s benefits and potential. Within the past two years, several initiatives have been implemented that demonstrated innovative concepts in Transportation Demand Management (TDM). Councilman Suarez is very engaged in regional conversations to ensure HART is constantly improving and collaborating with others. Public/Private partnerships with Megabus for the use of MTC for its inter‐city service, and RedCoach USA allowing access to MTC for its intrastate/city bus service. Councilmember Suarez traveled to DC to meet with the delegation members to advocate for HART’s regional proposal for the Federal Transit Administration TIGER Discretionary funds for the Regional Revenue Collection and Inter‐Jurisdictional Mobility Project. HART requested support to fund the purchase, installation, integration and interoperability of all 8‐county Tampa Bay regional transit agency’s evolution to a smartcard/e‐fare based seamless revenue collection system, and supporting back‐office, with one media type for all patrons, irrespective of location, replacing or enhancing current agency farebox technology Supported GO Hillsborough initiative. On Jan. 1, HART launched a pilot program with Yellow Cab to make travel more convenient for people with disabilities. Patrons can travel with HART Plus vans or book a same‐day, short‐distance taxi trip when that option is more convenient. Councilman Suarez was an early advocate for this initiative: First Mile & Last Mile‐ HART is teaming up with a private partner on a pilot first mile and last mile program to add ride‐sharing technology to our toolkit and connect more people to our network. On the CITY side Mike has approached the SoHo Business Alliance to create a program where patrons to restaurants and bars in SoHo would have parking options away from the district and then have HART provide a circulator/bus/trolley that would drive people top their destination. Allowing them to move up and down SoHo without having to drive or park within the district. Although this has not come to fruition and the businesses may want to go in a different direction, he has always encouraged them to think outside the box and has been willing to play an active role in reducing traffic congestion while providing a safe and reliable transportation option.